An ideal romantic luxury countryside retreat. This is a one bedroom cosy cottage full of character. With its woodburning stove set in the original inglenook fireplace in the snug sitting room, you won't want to leave. The new kitchen/dining room extension boasts great views of the river and will be full of light with its full length windows, not forgetting the private hot tub on your patio area. Fabulous property within easy reach of the best Snowdonia has to offer. A daily serviced private hot tub as well. What more do you need? Usually we go to Scotland for my wife's birthday but due to a family event in Yorkshire we decided on Snowdonia for this week. And what a great decision! 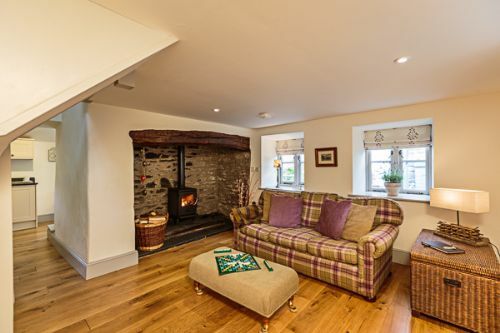 Absolutely gorgeous and cosy cottage with everything we could need or want. Beautiful location and all begun with a lovely welcome basket. Small touches like the unlimited fire wood was wonderful. Would not hesitate in recommending or returning. Thank you Andy and Jenny. Just spent a week at grilles cottage, excellent cottage with a very homely feel. After a day out walking with my two dogs it was fantastic to relax put the log burner on and sit in the hot tub. Good location to explore the area and plenty of places to walk the dogs. Overall a fantastic break and highly recommend it. setting. Our second visit to Rivercatcher but definitely not our last. Planning to come back again next winter for a nice little break to the same cottage. Rivercatcher have thought of everything, in great detail and it made our stay so special. Lovely, clean, warm and cozy cottage, in a beautiful location. Every that you could need is provided as well as a lovely welcome basket. Log burner and hot tub excellent features. Visited in February so also great value. Will definitely visit again. A truly wonderful holiday in the UK. The cosy little cottage with its wood burner was a delightful home from home. We took our two dogs who were well catered for Rivercatcher and spent the days walking in the local area enjoying breathtaking views. Jumping in our own private hot tub following a long walk was an excellent reward and on an evening we cosied up in the lounge with the wood burner. On days when we wanted a little more than this simplistic perfect existence we ventured into a lovely nearby village and dined at the superb Michelin star restaurant just moments away from Rivercatcher. Fantastic holiday, we will certainly return when we get the opportunity to!!! The cottage was perfect in every way. Really cosy and romantic. Great location for walking and cycling. A luxury cottage with everything you could need provided by the hosts to make our stay as comfortable & as easy as possible. The cottage is fitted out with top notch fixtures fittings & furniture making this a truly luxurious cosy place for 2. This was our 2nd stay & we will be back. This is our second time to Ghillie’s cottage , it’s a beautiful cottage, very clean warm, cosy and everything you could wish for even dog throws and water bowl’s proved. Lovely views over the river Dee from your breakfast table and hot tub. Staff on site very knowledgeable about area, Alid maintenance man very helpful and nothing too much trouble. Beautiful walking area from cottage and also great pud in working distance in local village. We had high expectations of Rivercatcher and it lived up to them. Access to the river Dee , hot tub, wood burner, friendly staff, We had a really enjoyable week. This is the fourth time we have stayed at Rivercatcher and we will certainly be going back again. The cottage was well equipped and a comfortable place to stay in. Also the added bonus of the welcome basket which had locally produced items in. Lovely views as you enjoyed a relaxing time in the hot tub. We came back because we enjoyed our first stay when it first opened.we have really enjoyed our 2nd visit the only comment I can make is that we felt the cottage needed a really good clean.It did not spoil our holiday in the slightest and will return again. Probably we were spoilt by the fact we first went when it was new and the cobwebs and dust hadn't had time to settle! Wouldn't hesitate to recommend rivercatcher cottages to anyone. They cater for everything you may need. Staff extremely helpful, informative, and friendly. Location and surroundings are beautiful. Ghillies cottage is a beautiful home away from home with everything you need for a week of relaxation . Located in a wonderful setting and nothing was too much trouble for the staff who were all very friendly. The whole process from booking to arrival to leaving was absolutely stress free. A top-end, dog-friendly cottage for two set in a beautiful part of Wales and ideally suited for trips to the north Wales coast and pictureque sites in the Snowdonia National Park. We hope to re-visit in Spring or Autumn to take advantage of the hot-tub. Great cottage set against a few larger cottages with outstanding views . The owners and staff are a pleasure to deal with , even sitting for our small dog so we could get out for a ride on our bikes. The cottage is cosy and comfortable with everything you need including a fabulous welcome pack, and a hot tub for soothing aching muscles after walking Snowdon. This is our second visit and we are already planning our next stay. Located 30 mins from National Park and a 20 minute drive to Llangollen you don’t have far to go to see what North Wales has to offer . Luckily we had fabulous weather but I am sure with the amenities on offer at Rivercatcher if the weather was not in your favour you would still have plenty to keep you occupied. Book up and enjoy . Such a lovely weekend ! We had a lovely weekend in Ghillies cottage. The cottage is decorated to a high standard and all the little extra touches made it lovely. The hot tub was a real bonus and was lovely to relax in whilst looking over the amazing views. The only downside was 2 nights wasn’t long enough ! We’ll definitely be returning. We were delighted with all that Ghillie's Cottage had to offer, albeit our time was cut short due to a family bereavement, but we will definitely return at some point and pick up from where we left off. Ghillie's Cottage and the Rivercatcher set up per se is delightful, beautifully kept and such a wonderful location. The private hot tub was a real luxury with such lovely views from it. Loved the cottage in every way, very cosy and comfortable. Owners/management and their team were all very helpful and we just knew that if there had of been a problem it would have been dealt with promptly. It is just under a mile to the village, albeit the main road is not pathed but it's not a busy road and you can easily see vehicles approaching. The village is very nice and friendly. There are some really lovely walks too from Rivercatcher. It was so sad to leave in so many ways so we look forward to returning, hopefully in the near future. Rivercatcher cottage is a wonderful, peaceful place for a relaxing holiday. The cottage is cosy, warm and welcoming, the wood burning stove is a lovely extra also the hot tub is a relaxing way to end the day. The cottage is everything you could wish for and the area is beautiful. The cottage is very clean also a well equipped kitchen. Aled comes in everyday to clean the hot tide. The cottage is equipped for your four legged friends as the garden is completely safe. Beautiful welcome basket on arrival.Please don’t take my word for it book this cottage for a relaxing break you won’t be disappointed. Where do I begin? It’s the cutest little cottage on the loveliest complex surrounded by fantastic views and adorable lambs! Located in the middle of nowhere it’s peaceful and serene! Would we return yes!!! Would we recommend yes!! We arrived to a welcome basket containing bread, jam, butter, biscuits and cooking oil. There was also a bottle of prosecco awaiting and a congratulations card as it was our honeymoon which was such a lovely touch. It’s big enough for 2 people without being cramped and is kitted out to meet your needs. Robes, towels, basic provisions, games and utensils in the kitchen all there. The owner was lovely and showed us around the new builds where we plan on returning to stay at. There was literally nothing wrong with the place. Power shower, nicely sized bath for 2 to fit in , hot tub easy to use with amazing views I mean what else could you ask for!! We stayed here for our honeymoon and couldn’t have wished for better. This cosy cottage was perfect. The location is peaceful and really beautiful and there are many places to visit a short drive away. The Precipice walk is a must. The enclosed garden was perfect for our dog and the views of the river are stunning, especially when a Hercules aircraft passes overhead, literally just above the treetops! An amazing sight. We cannot recommend this cottage highly enough. This was my second stay at Rivercatcher and a wonderful stay it was. Excellent location lovely property. Feels like a home from home. Thanks Again. We stayed in Ghillies cottage for 4 nights in January 18, what a fantastic stay it was. The cottage was well equipped, comfortable and extremely clean, the welcome basket was a lovely touch. There was also a couple of bowls, blankets and balls left for our 2 dogs. The local village is only a short walk away. We would highly recommend Rivercatcher for anybody wanting a nice relaxing luxury break. We will definately be back. We thoroughly enjoyed our stay at this lovely cottage which is in a beautiful setting. Very well equipped and comfortable. Loved the hot-tub and the log fire. Added bonus you can take well behaved dogs and not forgetting the lovely 'welcome basket' . We are repeat patrons due to loving all the cottage and location have to offer. It being pet friendly, with an enclosed garden is a huge attraction for us. Will definitely be visiting again and already telling family and friends they should visit for a weekend away! Really enjoyed our stay, everything you need is supplied including lovely welcome basket for us and the dogs. Very useful information and detailed walking routes found in guest book. Very beautiful surroundings and definitely recommend The Bryntirion pub nearby..just a short drive from the cottage and voted the most dog friendly pub in Wales. Very friendly and trally good food. Second visit to Ghillie's Cottage and the high standard has been maintained. The cottage is very comfortable and well appointed with everything you need and the log fire is very efficient, welcoming and easy to manage. Wonderful bathroom and very comfortable bed and the view from the dining table to the hills across the Dee is to die for. We did not use the hot tub but it is dutifully cleaned and serviced each day so if it is for you - great. There was one day when Storm Brian made going out totally unappealing but with a log fire, plenty of reading, wine and a smart tv the cottage provided a very comfortable and cosy refuge. The local produce provided in the welcome pack was delicious and of high quality. Ghillie's Cottage provides a high quality, intimate holiday experience for a couple who like the opportunity for walks in the locality or trips further afield to the coast, Snowdonia etc. Peace and quiet surrounded by amazing views, plenty of good walks followed by relaxing in the hot tub, which was kept very clean and topped up. Cottage was very well equipped, welcome basket and breakfast a nice touch, plenty of wood for the wood burner. Already thinking of returning next year. Thank you. Everything was fine, apart from the charge for using a british debit card to book and pay for the holiday, never had this before, I object to this as there is no cost to the person receiving the payment unlike a credit card. Sorry but it feels like a ripoff !! Thoroughly enjoyed our stay at Ghillie's Cottage. Having two young cocker spaniels we booked the cottage with a view to using this as a base to explore Snowdonia and some soggy adventures. Cottage was very well maintained and clean. Aled, the maintenance man, comes to clean the hot tub every morning. Loved the fenced garden area which looks directly onto the River Dee to the rear of the garden. It was easy to open the gate and let the dogs run and jump in to the river. For anyone staying here with a view to taking dogs I would just mention that most places require you to jump in the car and drive out to find a walk as the walk into the nearby village is a little dangerous along the A road. That said, we can recommend the farm walk at nearby Rhug Estate and the River walk at Bala National White Water Centre. For slightly further a field days out, we spent time at Barmouth exploring the Panorama Walk and Pennycloddau peak. We only had a short stay on this occasion but the whole experience was very well presented.Impressive from the moment we arrived.The whole area leds itself to relaxation.Walks abound,we particularly enjoyed Lake Brenig.The dog was in his element throughout.Well worth a return visit and almost certainly for longer. A thoroughly relaxing and enjoyable experience. Our second visit to Rivercatcher. A wonderful week of relaxation, enjoyment and renewal of local knowledge, as my wife was born and lived in the old Cilan Farm until the age of twenty. Cilan Farm became Rivercatcher, a miracle of design, catering for every need of visitors and a centre of tranquillity, comfort and great beauty. What was once a busy farm and yard has become a beautiful centre of calm and great comfort. Our cottage, which was once used as a dairy and store, has become a spacious, comfortable and well appointed luxury space in which we were able to relax and enjoy ourselves. Although all the cottages at Rivercatcher were fully occupied, we were not aware of other visitors being on site. The surroundings and river are beautiful, with many walks close by, so that our car rarely left the ample car park , though there are plenty of activities close at hand. The whole organisation of our stay was stressless and those members of the Rivercatcher team,encountered on site were friendly and helpful. This was our second visit to Rivercatcher and we hope to make many more visits. Rivercatcher is suitable for visitors of all ages, from children to ourselves, for we are in our late seventies. The welcome pack was most welcome and contained the very best of Welsh products. We had an amazing stay whilst holidaying in Snowdonia for 5 days. This beautiful modern cottage had everything that we could have possibly wished for. It was clean and tidy when we arrived. The luxury welcome hamper included bread, red wine, welsh butter, welsh rapeseed oil and welsh shortbread biscuits. When we opened the fridge we were amazed to find bacon, sausages, eggs, tomatoes, mushrooms, black pudding, milk and fresh orange juice all ready for us to make a cooked breakfast the next morning. What a lovely surprise. The cottage also had some tea bags and filter coffee for the caffeteirra machine. Washing up liquid, hand wash and dishwasher tablets were also provided (it was lovely not having to do any washing up!). We used the hot tub every day which was lovely and relaxing to get into after a long day out (especially after climbing Mount Snowdon!). It was nice to have hot tub towels provided. We enjoyed the view from the kitchen window and loved walking down to the river from the cottage. The cottages are in quite a remote area so there is hardly any noise (very different to the town lifestyle we are used to which was nice). The nearest supermarket we could find was a Co-op in Bala. Whilst we were there we climbed Mount Snowdon which was amazing and definitely recommend to anyone visiting this part of North Wales. We also visited Pistyll-Rhaedar waterfall, Barmouth Beach, Zip World Slate Caverns, Conwy Falls Waterfall and Coed Y Brenin have an amazing nature park where we did some walks and hired some mountain bikes. There are lots of lovely pubs/restaurants around the area. On our last day we also visited the Rhug Farm Shop Estate and had lunch there - some of the best food we've had eaten so definitely recommend a trip there (think it was only 20 mins down the road?). Snowdonia is a beautiful part of the UK and we would love to return one day. Thanks again! The cottage had everything we needed to help us have the restful holiday we needed. The narrow stairs were unique but did make getting a large suitcase up them tricky. Will use smaller holdalls next time.....and there will be a next time. This was our second visit to Rivercatcher. It was as lovely and peaceful as I remember. We will definitely come back. Rivercatcher never fail to deliver. Looking forward to the next time and trying out one of the other cottages. Great short break in a luxury romantic cottage . All amenities were great. Views across the river were jaw dropping . Welcome basket well received. That impressed we immediately booked the same week next year. Fab as always a credit to the owners for their hardwork. This is our second time and we are back for a further two weeks in September. Keep it up guys. The place is fabulous, setting great and easy to drive to from Cheshire. The cottage has great facilities, is ideal for two people and a hound. We had a lovely weekend and hope to return. This cottage was all that we could have asked for. Its location provided the peace and quiet we hoped for with easy access to stunning scenery. The welcome basket was much appreciated as was the welcome given to our dogs. We would certainly stay here again. Ghillie's Cottage was immaculately clean and equipped with high quality fittings. The location is stunning with wonderful views and a wide variety of bird life to spot and a high level of privacy not being overlooked by other properties.The bed was extremely comfortable and although the cottage is compact its clever design makes it ideal for a couple. We were prepared for the cottage to be cold but it was very comfortably warm and we did not need extra layers and the very efficient heated towel rails were very welcome. The shower was superb and the bathroom fittings top quality.The welcome pack was lovely and very much appreciated andthere was an ample supply of tea, coffee, cleaning materials etc. We have already booked a return visit for the autumn. Each cottage has it's own space, privacy and uniqueness. Megan loved the freedom in the secure garden and sitting watching the wildlife at the floor to ceiling window in the kitchen. I loved the warm, homely cosiness and Phil loved the hot tub. We've already given contact details to friends and can only hope there's availability when we can visit again. My boyfriend and I stayed at Ghilles Cottage for 3 nights and we had such a great stay. The cottage was lovely, clean and very homely! The log fire and the hot tub were a bonus as we didn't have the best of weather! The cottage has lovely surroundings with the river at the back and is also very private. We loved the welcome basket which was a great touch. Also the maintance man was so friendly and helpful, sorry we didn't get his name! Thanks so much rivercatcher would highly recommend this Cottage and would love to return! very well kept properties with lovely views across the river Dee. welcome package with the local produce was very good. Attention to detail in cottage was exceptional . Love staying at Rivercatcher, everything is thought of and the cottage is so cosy. We will definitely be back. There is not a single thing we would change about our stay with Rivercatcher, the location, facilities and experience were truly unforgettable - we will definitely be back. The cottage we stayed in was so comfortable .the log fire lovely to come back to after a day out, also the hottub was very relaxing even though the weather was cold. Cottage very well equipped and a lovely welcoming pack. An extra plus was they are dog friendly. Rivercatcher is in beautiful surroundings, we were lucky with the weather but if it had been rainy ,there are plenty of books and games in the cottage and a Smart television with Netflix , not forgetting the lovely games room. Couldn't fault it! Perfect in every way. We stayed for 5 nights over new year. The dog enjoyed it too. We will be back! Really enjoyed our stay at Rivercatcher. Cottage was lovely, views were idyllic and having our own hot tub was a real bonus. Was also great to have Netflix on tap both upstairs and downstairs. All in all a great Christmas stay. Would recommend it to anyone looking for something similar. Just perfect. The cottage was amazing, it had everything you could possibly need. the hot tub was lovely, we spent two nights in there looking at the stars! Location excellent. We have already booked to go again next year! Had a wonderful few days staying in Ghillies cottage with my husband and our dog. The cottage has everything you could need and a few extras! Comfortable, clean with an amazing view over the river. Can't rate it highly enough.